Hey guys. I have a 79 z28 with a 383/4 spd combo I bought off a friend. Here's the issue. When I try to push start it with the clutch engaged, the car rolls fine. However when I pop the clutch the car grinds to a jerky halt. Anyone heard of this before? Seems that if the motor was locked up there would be no rotation if the clutch was engaged or disengaged. I pulled the distributor to see if the shaft was sheared and it was not. Also drained oil and smelled gas when I drained the oil with no metal visible. Dunno what to think. Thanks for your time guys. Sounds like a bad clutch disc. Thanks so much for the insight and I'll definitely add that to my list for troubleshooting. Nice Z by the way! 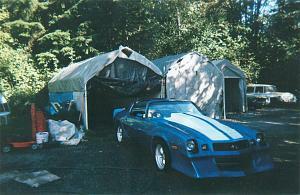 Mine is blue w/ black stripes, planned on Dakota sweeping dash w/carbon fiber backing and old school Chevy wood wheel. But due to finances probably going to sell soon. Thanks again for your time I really appreciate this. Take care, God's Blessings! Remember its just a hobby.and set a budget each month.and if you can`t afford something just save your money and do what you can. hey formula79 got a ?? clutch, engine, flywheel, or switch.